Social determinants of health are the conditions in which people are born, grow, live, work and age. We know that eating well and exercising, getting recommended vaccines and screening tests, and seeing a doctor when we are sick all influence our health. However, our health is also determined in part by where we live, how safe or stressful our environments are, and our access to quality education, healthy foods and transportation. Social determinants can affect health and quality of life outcomes long before we need medical care, and these factors explain in part why some people are healthier than others. 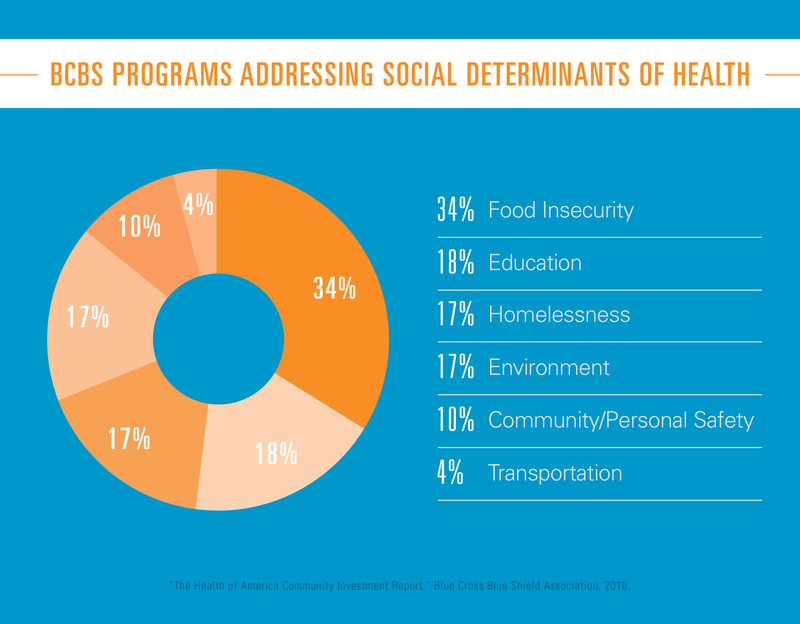 How do social determinants impact our overall health? Conservative estimates show 60 percent of health outcomes are driven by social determinants of health, including lifestyle behaviors and environmental factors. This is particularly true for people with chronic disease, as social determinants impact the development of hypertension, diabetes and coronary artery disease, among others. How do we address social determinants of health? Addressing the social determinants of health has become a top priority for public and private institutions. Many state Medicaid programs and the Children’s Health Insurance Program (CHIP), for example, have introduced alternative payment models aimed at improving health outcomes by engaging people in their personal well-being. Through the Healthy People 2020 initiative, the U.S. Department of Health and Human Services (HHS) has identified social determinants as a high priority issue representing a significant threat to public health, and is working across sectors to create and implement programs that address a range of needs. Important strides are also taking place in the private sector, as public health efforts cannot address social determinants alone, and businesses are well-positioned to do so through scalable and sustainable business practices. The BCBS Institute is using the “zip code effect” to shine a light on transportation, pharmacy, nutrition and fitness deserts in neighborhoods across the country and then provide resources to address those needs. A partnership with Lyft®, for example, is intended to help Blue Cross and Blue Shield plan members who don’t have adequate transportation get to their doctor and neighborhood pharmacies at no cost. Meanwhile, the Anthem Foundation has partnered with the American Lung Association to help people in low-income housing units quit smoking. Americans living below the poverty line are more likely to smoke cigarettes, leading to worse health outcomes, particularly for children. In Arizona, Blue Cross Blue Shield of Arizona is helping people make smarter food choices by organizing healthy cooking demos and providing opportunities for residents to exchange unhealthy foods for healthier choices. All product names and brands are property of their respective owners and used for identification purposes only, and are in no way associated or affiliated with the Blue Cross and Blue Shield Association. Use of these names and brands does not imply endorsement. Blue Cross Blue Shield of Arizona is an independent licensee of the Blue Cross and Blue Shield Association, an association of 36 independent and locally operated Blue Cross and Blue Shield companies.